The Flomenhaft Gallery is proud to present Russian born Rimma Gerlovina and Valeriy Gerlovin’s exhibit, “PERHAPPINESS.” Sophisticated and collaborative, theirs is an art form that makes a difference. In the mid 70s they were in the vanguard of Moscow’s underground art. Artists and viewers gathered together in their apartment. The oppressive atmosphere in Russia prohibiting free expression fostered active theatrical participation between artists and viewers. The Gerlovins came to America in 1980. Here they made a transition from performance art to “still performances.” In C prints, they synthesized all their former forays into performance, poetry and sculpture. They view art as “an organic union of interrelated parts whose balance, as in any living organism, is important to maintain.” Linguistics and numerological systems are the sources and substance of their spiritual pilgrimage. Rimma majored in philology (literature and linguistics) and their art rests on the shoulders of that curriculum. The Gerlovins have created a new order built upon old wisdom viewed through the magnifying eye of photography. Using the camera as their tool, mythology, mysticism, and literary puns are played off against each. Body and skin are the human parchments for their visual formulas. 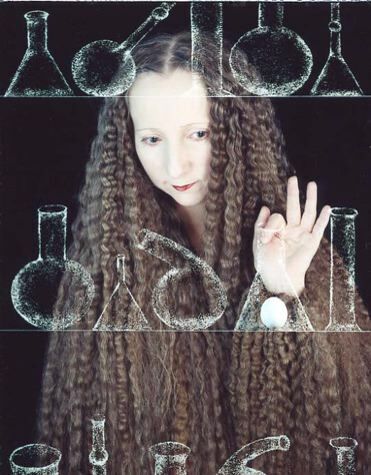 Rimma‘s long hair is a ubiquitous element in their compositions. In “The Pilgrim” it metamorphoses into a cloak; and it covers her shoulders as a shroud in “Slow Heating.” Most often Rimma is the subject and her ethereal beauty has been correctly compared to a Botticelli female. Speaking of their “still performances” the artists say: “These images briefly sum up certain trends in our art that closely link to the whole sequence of life’s PERHAPPENINGS. to follow our intuition, not the mind.